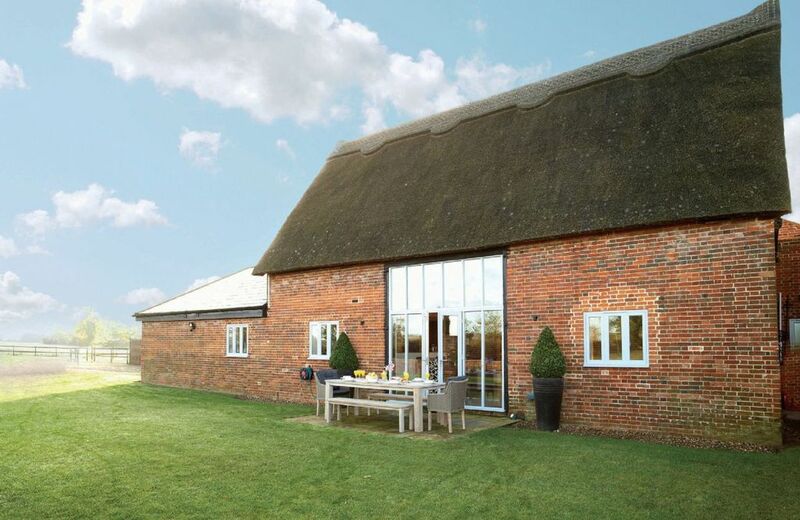 Thatch barn is surrounded by open countryside, on the edge of the picturesque Norfolk Broads. Four double bedrooms, three bathrooms. Sleeps eight. Parking for four vehicles. Surrounded by open countryside, on the edge of the picturesque Norfolk Broads, Thatch Barn is ideally and centrally placed for exploring the unique broads and rivers, the North Norfolk coast and the ancient cathedral city of Norwich. This linked barn is approached by a shared drive and offers wonderful views. Providing a modern contemporary feel, whilst retaining many of its original features such as the exposed beams and open brickwork, the barn is light and spacious with french doors from both the sitting room and some of the bedrooms leading out to the garden. Three bathrooms with showers (ground floor). Parking for up to four vehicles. Spacious vaulted open plan barn, with thatched roof. Light and spacious with numerous french doors leading out to the garden. For access Norwich a mainline rail services to London Liverpool Street (1 hour 40 minutes) and the Midlands..
Electric oven and hob, microwave, fridge/freezer, dishwasher, washing machine, tumble dryer. Flatscreen TV with basic Sky package, DVD and CD player, Bose entertainment system. The small village of South Walsham is only two miles away and boasts two pubs, a post office and store as well as the magical Fairhaven Woodland and Water Garden where you can enjoy ample, wonderful walks. A little further and you will discover the thriving village of Acle (three miles), sometimes known as &ldquo;The Gateway to The Broads&rdquo; due to the River Byre flowing out to the coast in one direction and to the Broads in the other. Here you will be able to find all your necessary amenities. Within close proximity you can go and explore the cathedral city of Norwich (eight miles) with its Norman castle and lively bars and restaurants. This vibrant city has a wealth of places to visit and often you will discover a festival of some sort occurring within the heart of the city. If you would prefer something more active and are craving the sea air, the beautiful beaches of the North Norfolk coast are 30 miles away. However, slightly closer to home you can visit the nearest broad with its waterway and boating. Otherwise there are an abundance of activities to try on the lakes such as rowing, canoeing, kayaking and water zorbing. Slightly further afield (30 to 70 minutes) there are a wealth of stunning gardens and spectacular homes to admire. This includes Holkham Hall, Oxburgh Hall, Castle Rising, Raveningham Gardens, Mannington Gardens and Walsingham Abbey and Grounds to name but a few. En-suite bathroom with separate shower. En-suite bathroom with shower over bath. Bathroom with shower over bath. Oil central heating. Electric oven and hob, microwave, fridge/freezer, dishwasher, washing machine, tumble dryer. Flatscreen TV with basic Sky package, DVD and CD player, Bose entertainment system. WiFi*. Garden furniture, barbecue. *Please note that internet access is offered at this property for recreational purposes only and is not meant for business use. Speed/service may vary depending on the package obtained by the owner which is provided to guests free of charge. Should guests experience difficulties or loss of use, neither the owner nor Rural Retreats will be held responsible.